I've always got chapped lips, so I'm addicted to the lip balm displays at every drugstore counter in New York City. Yes, I'm the one holding up the line because I can't stop shopping. My favorite drugstores stock Burt's Bees close to the register so I can buy on impulse. 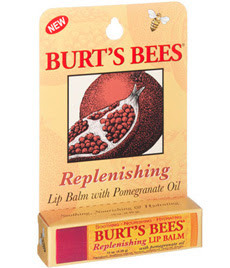 This is how I discovered my new lip saver, Burt's Bees Replenishing Lip Balm with Pomegranate Oil (the big fruit of 2007). I love how it smells, it actually keep my lips chap-free throughout the day, and it gives me a slight berry tint. I like a little color from my lip balm. Look for it in Walgreen's at 5th & 33rd on the lower level temptingly displayed near the check-out. It's just $3.49. Next time I'm going for their "Super Shiny Lip Gloss." At this Walgreen's you can also pick up Bumble & Bumble, Bedhead, and Chi hair care products, or Iman's makeup line. Speaking of natural, W magazine this month says "Burt's Bees is fed up with other beauty companies calling their lines 'natural' when they're not." Go, Bee, go. So the company has "teamed up with the Natural Products Association to create the Natural Standard...Products that meet the standard will be marked with a seal, which will begin to appear this year." Thanks, Burt's Bees, because for a while I've suspected "natural" is just a good way to charge a little more for a product. Keep an eye out for that seal.